The late, lamented DC Comics’ Minx line of graphic novels is long gone, but I keep on picking up them when I find them. This is because every one I have read has been so good. It also was an attempt to serve a terribly represented market for comics: Women and teen girls. Alas, now that Minx has been gone for years now, it seems I’ve got about every book from the line thanks to my most recent find. 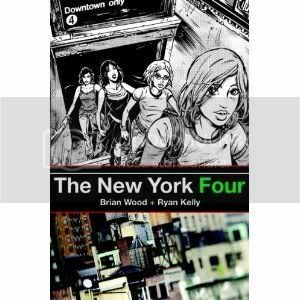 The New York Four by Brian Wood and Ryan Kelly was a bargain-store find, which is the unfortunate destination for most of the line. Drawn in a pseudo-manga style by Kelly, it offers up a crowded and cluttered New York City that matches the angst and worry of Riley, a college freshman, who’s trying to break away from her sheltered Brooklyn roots. (I didn’t know that living in Brooklyn was “sheltered,” by the way. I’m from the real sticks, and I can tell you I was way-way-way more sheltered). Anyway, Riley breaks free by meeting up with her disowned sister, who lets her in on some family secrets and soon becomes her long-sought best friend. As Riley gets more frustrated with her parents, she finds herself befriended by a new group of college girls. Like her sister, those new friends help draw Riley out of her introverted ways, only to watch her get sucked away again when she becomes obsessed with a cyber-boyfriend. Much of the 152-page novel plays out like a mystery. Who is the elusive cyber-boyfriend? How is it he knows so much about her? Why won’t he meet her? The answers to those questions are surprisingly easy to figure out, and spoils any hope of a layered story. Instead, readers are simply along for the soap-opera ride as Riley’s choices work to unravel her pampered life. Sure, “The New York Four” is a perfectly fine, “after-school special” style story for pre-teens, but don’t expect any more.